It’s soup time! Although the fall weather here in Seattle is still fairly warm and sunny, the shadows are long and there’s a tinge of crispness in the air, even in late afternoon. The perfect remedy for the cooling weather is soup. If you’ve been to your local farmers’ market lately you’ll have seen the piles of winter squash – so many beautiful shapes and colors! I love to use it many ways but the following recipe is one of my favorites. Once you have the pumpkin roasted, it comes together in a snap. It’s just as good on day two or three, as the first day, and it freezes well. You’ll see some ranges in the ingredients list. The instructions include how to choose the amount you need. Preheat the oven to 400°F. While the oven is heating split the squash in half and remove the seeds. Place the halves open side down on a baking sheet. Bake for about 1 hour, until a fork easily pierces the flesh. Remove the squash from the oven and let cool until you can handle it without burning yourself. Scoop the flesh from the skin. Place the squash in a food processor and process until smooth. You don’t want lumps in your soup. Set aside. Add the oil to a 5 quart pot. Heat over medium heat. Add the garlic and ginger, stirring often. Sauté until soft and fragrant, about 2 minutes. Add the curry powder or paste. If you are using powder, start with 2 teaspoons. If using paste, it will depend on how hot your paste is and how much heat you like. Start with 1 or 2 teaspoons. (Once the soup is complete, you can add more powder or paste if you’d like a little more heat.) Stir the curry into the garlic and ginger. Add the wine, pumpkin, lemon juice, brown sugar and about 3 cups of stock. Mix thoroughly. If the soup seems too thick, add more stock. 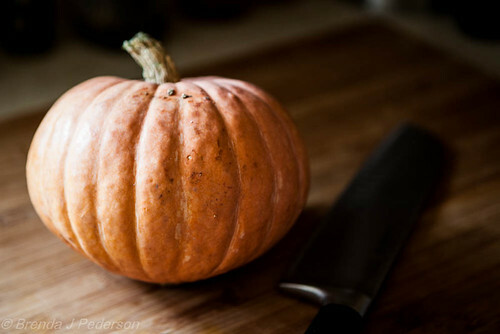 The amount of stock will depend on the type of squash you used (pumpkin has a lot of water in it, other squash can be pretty thick) and if your squash was closer to two or three pounds. Simmer for 5 minutes. 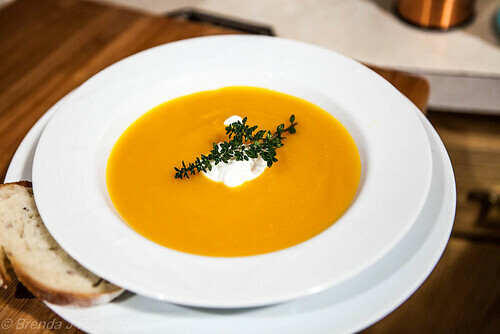 Place soup in warmed bowls, garnish with a dollop of sour cream and a sprig of thyme or cilantro.